Generally, it kept saying error reading while you copy Iron Man 3 DVD with general backup software like Handbrake or DVDfab. Why? Walt Disney Co., the owner of Marvel Entertainment, acquired the distribution and marketing rights to 2012 Marvel's "The Avengers" and this year's blockbuster held by Paramount Pictures. And it can be ratiocinated that Disney put a new protection variant on this Iron Man 3 disc. So if you are still using the common DVD copy software to backup Iron Man 3 DVD, problems will occur. Then how to copy and rip DVD without a hitch? Wanna put DVD movie to iPhone, iPad, Android easily? As common software fails to fulfill the needs, you'll need a professional DVD decrypter that can do away with this Disney copy protection from the Iron Man 3 DVD before copying it onto your computer. Never Mind, MacX DVD Ripper Pro is the ideal DVD ripper software. Boasting exclusive DVD Analysis Technology for the latest DVD movies, this DVD ripper for Mac is capable of stripping CSS, region code, RCE, Sony ArccOS, UOPs, Disney new copy protection, etc off DVD and helps to easily rip copy protected DVD to iPhone, iPad, Samsung, HTC, etc with blazingly fast speed and original quality. Decrypt and ip DVD Iron man 3 to MP4, MOV, AVI, H.264, or iPhone, iPad, Apple TV, Samsung, HTC, Xbox, PS4, Chromecast, and USB videos with MacX DVD Ripper Pro. We provide two different versions for different users, so please choose the correct OS version. Step 1: Import DVD Movie or DVD Folder. Select the output format as you desire, like DVD to MP4, DVD to FLV, DVD to MOV, DVD to iTunes, etc. By the way, you can also copy and rip Disney DVD Iron Man 3 on Mac's hard drive by hitting the "DVD Backup" button. 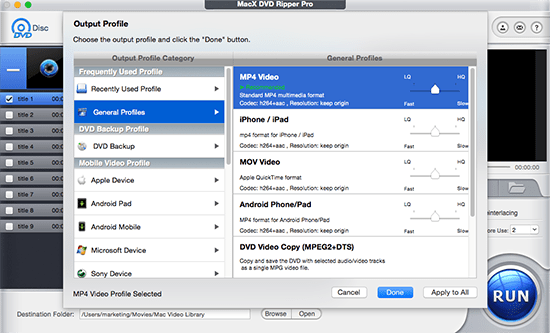 Tips: MacX DVD Ripper Pro regularly updates to keep pace with latest technology. The recently updated version supports the latest Mac OS operating system Mavericks, making you rip DVD on Mac Mavericks an easy task. Besides, this DVD ripper offers optimized profiles for iPhone 5S/5C, iPad Air, iPad Mini 2, Galaxy S4, HTC One, Google Nexus 7, Kindle Fire HD, etc, so that you can play any DVD movies on your gadget wherever you are. Hit the "RUN" button to start copying and ripping DVD disc on Mac. After a period of conversion, you can import and play DVD movie on your devices anywhere anytime. Please note that besides ripping DVD Iron Man series on Mac, this DVD ripper also helps to backup and rip the new copy-protected DVD movies like Monsters University, The Avengers, etc. in a few clicks. Wondering how to rip movies from DVD on Mac computer? This tutorial will give you an easy solution to decrypt DVD and get you movies like Iron Man 3, Fast and Furious 6, etc off DVD onto Mac with a professional Mac movie ripper.